GEM- CHECK is the digital GEM-WORK inspection that enables the technician to complete the check list digitally and take notes. 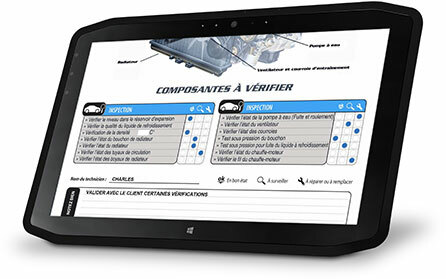 More than 30 inspection forms are available from an oil change inspection to an electronic diagnostic inspection. Save time as the customer’s information is transferred and all the technician has to do is fill out the inspection. The most popular is our visual safety inspection during tire change over because it generates from $300 to $500 in repairs. Some repairs need to be done now and others are less urgent? No problem, reschedule some work to another time in one click.